The Spirit EL-1 elliptical is the most basic model in Spirit’s Esprit line of ellipticals. Fortunately, although this line-up is relatively new to the exercise scene, it is a solid performer that fills a need. The Esprit EL-1 is a solidly built, basic elliptical for anyone who is looking for stability and strength rather than lots of fancy extras. The Spirit EL-1 elliptical offers you value without skimping on durability or reliability. You can find other models in this price range (between $900 and $1300, depending on where you buy it and the current sale price) that may have more functions on the console or articulating foot plates, but most won’t feel as sturdy or give you the same smooth glide. Spirit has chosen to focus on key needs and is striking the right note. There aren’t a lot of elliptical reviews yet for this product, but the ones that are out there for the Esprit EL-1 are mostly positive. Consumers like the heft of the machine (it weights nearly 200 lbs.) and the smooth operation and stability. The 24 lb. front flywheel has a lot to do with the stable ride. Experts admit that the EL-1 elliptical is a great machine for even a serious exerciser, but they do wish it had more extras. The limited array of programs and the lack of some console features such as a calorie counter are noted. Of course, for most in-home users, eight programs are sufficient. One complaint about the Spirit EL-1 common to both pros and consumers is that Spirit needs to improve the assembly instructions. Difficulty understanding them, coupled with missing bolts and other small parts, has frustrated many users. Once they get the parts and muddle through the assembly, however, they are overwhelmingly pleased with the performance. The Spirit EL-1 elliptical is a reliable, powerful machine. Most users rank it near the top of the heap in this price range. If you’re looking for lots of bells and whistles, you may not be happy with this machine. If you want a machine that will last for years and be reliable without paying the price for a commercial machine, the Esprit EL-1 elliptical is good investment. We do wish Spirit would up their game by being a bit more careful when packing and shipping, but once you get your machine assembled, you’ll be happy with the results. The company got all of the basics right: 18” stride, 16 levels of resistance and a heavy front flywheel are all part of what makes this an excellent package. 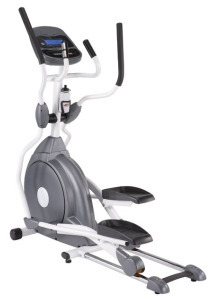 The generous warranty on the Spirit EL-1 elliptical is a definite plus. Not many elliptical machines at this price point offer lifetime coverage for the frame and brakes as well as three years on parts.